Imagine sipping a smoothie and reading a book to the soft sounds of Sade while your little one practices his or her ‘moves’ (tummy time or toddling, silly!) in this humorous t shirt. This “SMOOTH OPERATOR” shirt is a part of the Use Your Words™ collection and offered on a ‘standard-issue’ fitness gray jersey knit. 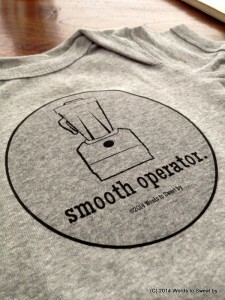 It is 100% cotton and available in baby bodysuits and toddler t-shirts.